For a tiny archipelago with only a 328.14 square km landmass, Palau has an intriguing biodiversity of its own. Of the volcanic, coral atoll, and limestone islands of Palau, approximately three-fourths is covered in native forest and mangrove. These pristine forests of Palau are the most species-diverse in Micronesia with 1400 species of plants, and an estimated 194 endemic plant species, including 23 endemic species of orchids. Palau is also home to one of the world’s most unique phenomena – the Rock Islands. Bird watchers can explore the Ngermeskang Bird Sanctuary. 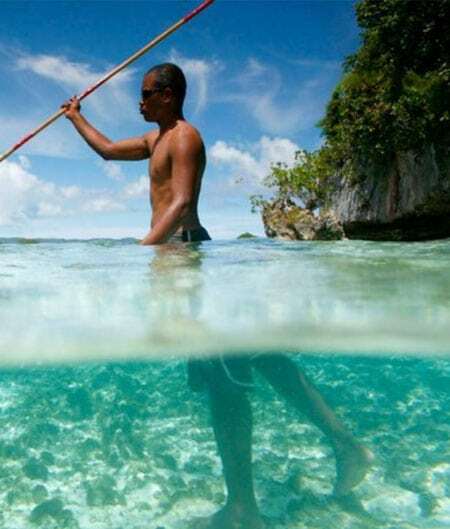 Palau has an abundance of the most spectacular sports fishing opportunities. If you like reptiles, you could find at least 46 species of reptiles and amphibians, and at least 12 of these are endemic. Sea turtle lover? The most common sea turtles are the hawksbill turtle (ngasech) and green turtle (melob), which are the only two species that nest on beaches in Palau. The leatherback, loggerhead and olive ridley turtles occasionally pass through Palau’s waters. Palau’s saltwater crocodile (ius), an endemic species, can be seen in the mangrove estuaries or even as far inland as Lake Ngardok Nature Reserve. There are also two species of sea snakes, including the black and white banded sea snake (mengerenger), and several species of non-poisonous snakes found on land. Palau has 2 endemic species of bats, the large Fruit Bat which can be seen during the day, and the small, nocturnal insectivorous Sheath-tailed Bat found around limestone caves. For birders, you will note that Palau has 168 recorded species of birds, and 13 of these are endemic, only found in Palau. 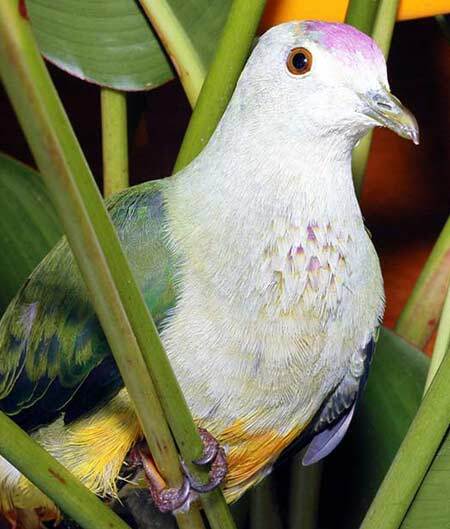 Some of the rarest birds to see are the Palau Ground Dove (Omekrengukl) and the Giant White-eye, which can only be found in certain locations in the Rock Islands. The Palau Megapode (bekai) is now an endangered species. Some of the endemic birds also have the most intriguing way of life, such as the Palauan flycatcher (chermelachull) which sings in the rain and decorates its nest. 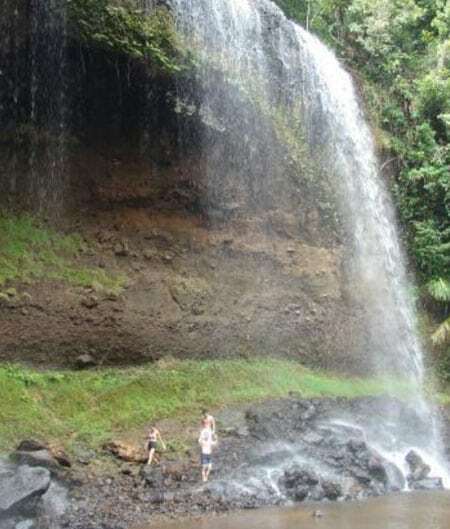 One of the best places to view some of the endemic birds is at the Ngermeskang Bird Sanctuary, and an ibird app including Palau has been developed on https://itunes.apple.com/us/app/ibird-hawaii-guide-tobirds/id943689969?mt=8#. Palau is also home to one of the world’s most unique phenomena – the Rock Islands. These are collections of largely uninhabited, mushroom-shaped islets located in a vast lagoon protected by fringe reefs from the fury of the open sea and they house one of the world’s greatest concentrations of coral and marine life. 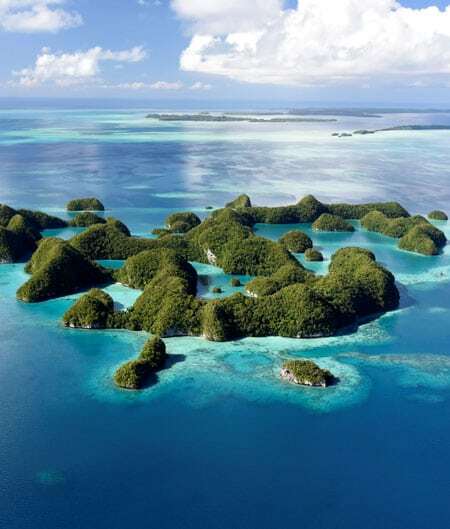 Palau, to date, has 586 islands with Koror and its southern lagoon containing a majority of 424 Rock Islands.Schools of fish feed in the shallows of the reefs, exotic birds nest in high reaches of these Rock Islands and on occasion, majestic birds soar directly above with imperial bravado. Attractions most can only dream of also include the daring and the unusual – like Jellyfish Lake, where two types of jellyfish can be found, namely the golden jellyfish known as Mastigias and the moon jellyfish known as Aurelia. This intriguing lake departs radically from convention for it is an enclosed body of water wherein, over the course of millennia, resident jellyfish have completely lost their sting because they have not had to fight off predators. Instead, they spend their days in privileged leisure, pulsating gently from one side of the lake to the other while catching the sun’s rays and feeding on the generous algae rich waters. There is also the incomparable Ngerukuid Islands Nature Reserve commonly referred to as “70 islands”, a group of islands with maze like channels and aquamarine water. 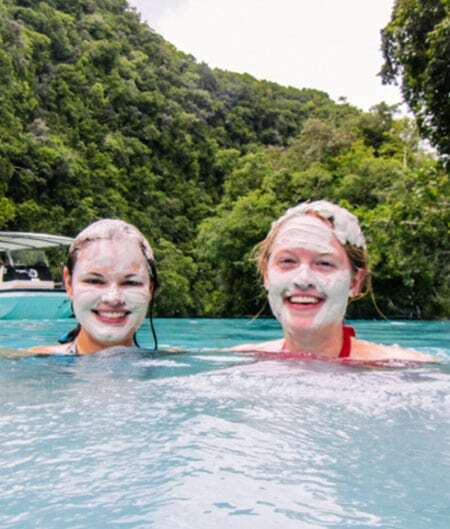 Regular sightings of Manta Rays are not uncommon either, as in the German Channel where they come in to hover over rock outcroppings, while having their expansive slippery surfaces serviced by cleaner wrasses. The second largest landmass in Micronesia is Babeldaob Island, which is joined to Koror by the Japan-Palau Friendship Bridge. Eighty percent of Babeldaob island is covered by mangrove forests, with long tentacle-like roots that emerge from the sides of the trees trunks and branches and hang down to reach the water. These are nurseries for marine life, and if you look closely, you can glimpse a school of archerfish that readily spits out beads of water to hunt down food. The seagrass bed is home to rabbit fish and various species of sea cucumbers. Past the seagrass bed is Palau’s inner reef, where you may find the giant trevally, white-tip reef shark, green turtle, giant grouper, eel and rainbows of reef fish. The clear waters of the reef crest, like a pristine garden, contain beautiful species of coral (polyps) and small reef fish. Most of Palau’s dive sites are located on the Outer Reef, and this is also true around Babeldaob island, which has channels with manta rays and aggregations of groupers. 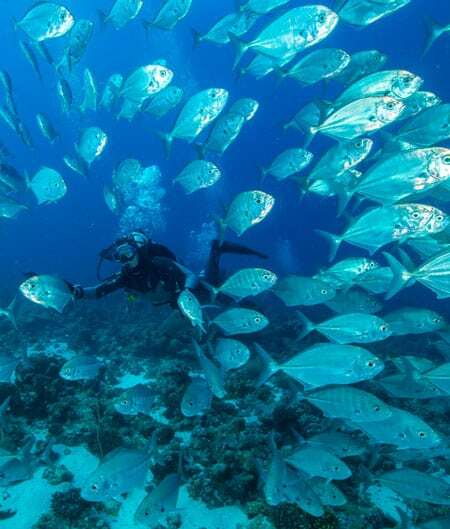 Deep drop-offs also boast enormous fan corals and pelagic fish.